If you’re a big fan of a local winter farmers’ market, Goat Cheese Appetizer Skewers are for you. Start by chopping and roasting beets—we used red and gold ones, but that’s your call. Whip up some goat cheese balls with your favorite herbs and slide everything on a sprig of rosemary. This simple, tasty finger food as pretty as it is down to earth. Peel and cut the beets into 24 pieces. Toss with olive oil, season with salt and pepper and roast for 40-45 minutes or until tender. Cool. Mix the goat cheese and herbs. Roll into 24 balls. Chill for about 15 minutes. 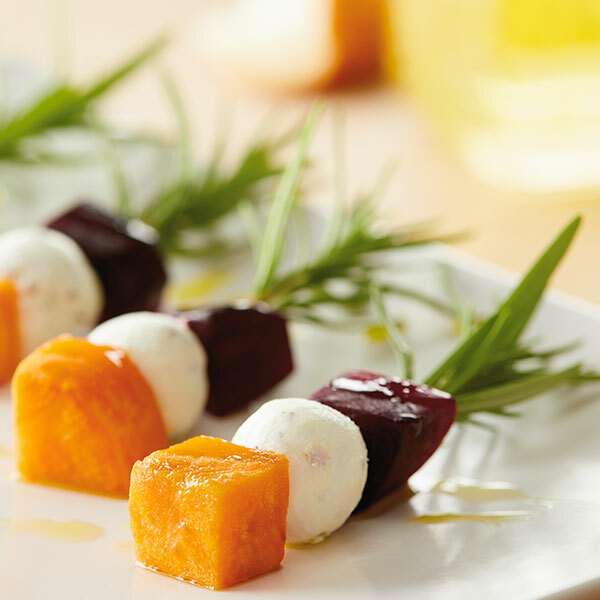 To assemble, skewer each cheese ball between one cube of red beet and one cube of golden beet with a rosemary sprig.